Delivering superior customer experiences requires disciplined management and cultural commitment. Customer experience consultancy McorpCX was interviewed for “Customer Experience Maturity Defined,” a Forrester Research, Inc. report authored by analyst Megan Burns. According to the report, “To excel at customer experience, organizations must routinely perform the practices required to design, implement, and manage customer experience in a disciplined way…. Most companies say that they want to differentiate themselves through superior customer experience. Very few manage to do it. Michael Hinshaw, President of MCorp Consulting, commented: “Most of the organizations we talk with are very interested in improving customer experience. But often the solutions aren’t as simple as they’d like, and recognizing the discipline involved in achieving this can prove intimidating. The good news is that, while complex, the roadmap towards improvement can be straightforward with some preparation." "MCorp's approach to developing customer experience maturity is based on nearly a decade's worth of research, development and hands-on assessment and improvement initiatives for dozens of companies. Starting with an understanding of customer wants and needs – from the customer's perspective – customer experience strategy and design closes the perceptual gaps between expectation and experience by helping companies regularly meet or exceed customer expectations of the brand. "While understanding customer expectations and needs is the foundation of any ongoing effort, defining and implementing the processes that support experience improvement as a discipline are just as critical," continued Mr. Hinshaw. "From the alignment of experience strategy with performance metrics, rewards and compensation to cross-channel, enterprise-wide governance systems, achieving customer experience maturity is really a cultural commitment," he concluded. As noted in the report "Organizations looking to move up the curve should take stock of how they perform today, and build a plan to turn an ad hoc set of activities into a self-improving customer experience management machine…. 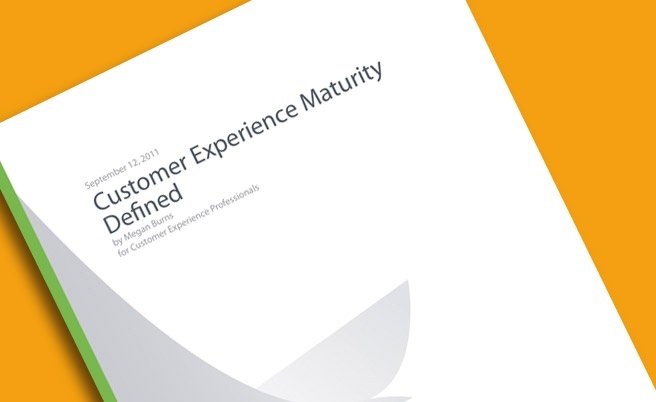 Customer Experience Maturity Doesn’t Just Happen."